Julie Fortenberry, a Registered Dietitian, gave a talk to parents and students at Our Lady of Fatima Elementary regarding healthy eating habits for students. Ms. Fortenberry tailored the first hour of the discussion to PK2 – 3rd grade students. The discussion ranged from meal planning, lunch box prep and proper snacking. In hour two, the focus shifted to the older students (4th grade to 6th grade). Topics included nutrition basics, performance fuel for athletic competition, and weight and body image. “Nutrition is so important to the overall well-being of our students”, said Principal Cindy Hahn. We wanted to bring in an expert to help educate students and their parents on how to encourage healthy eating habits”. 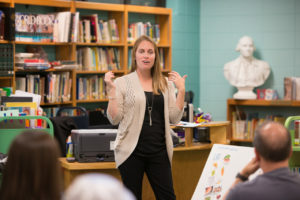 Julie Fortenberry, RD, presents good nutrition for students.